One of my children’s favorite healthy snacks is my homemade granola with plain Greek yogurt. Granola can be pricey but it’s super easy and inexpensive to make yourself. Greek yogurt is higher in protein than regular yogurt, which helps promote fullness. It also has half the carbohydrates of regular yogurt, but watch the fat content. You may want to buy either low fat or fat free yogurt. 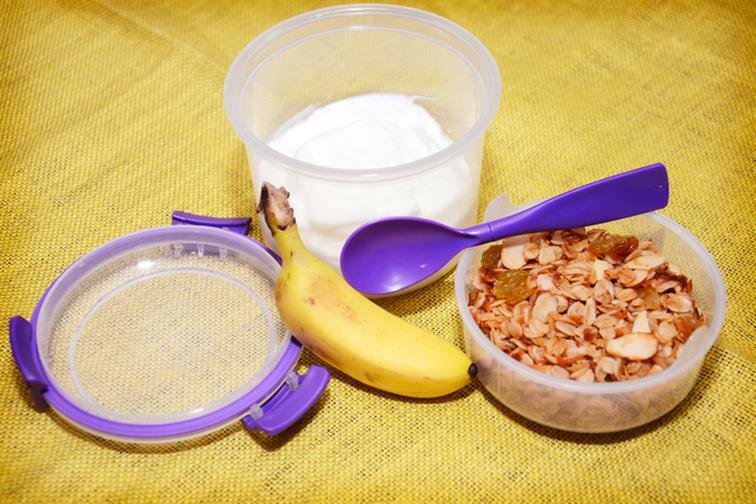 Throw in a mini banana which fits perfectly in a lunch box and you have the perfect healthy snack. In a large bowl, combine the oats, almonds and coconut. In a separate bowl, combine maple syrup and oil. Combine both mixtures and pour onto 2 sheet pans. Bake for about 30 minutes, stirring after 15 minutes to achieve an even color. Remove from oven and transfer into a large bowl. Add raisins and mix until evenly distributed. Great mixed with plain yogurt, milk or even over vanilla ice cream (for dessert).